Provide a new building for New Hanover County's Department of Social Services and Health Department. Conduct a series of space needs analyses with the Department of Social Services and the Health Department to determine spatial requirements, as well as discover how the individual departments should interact within a shared building. 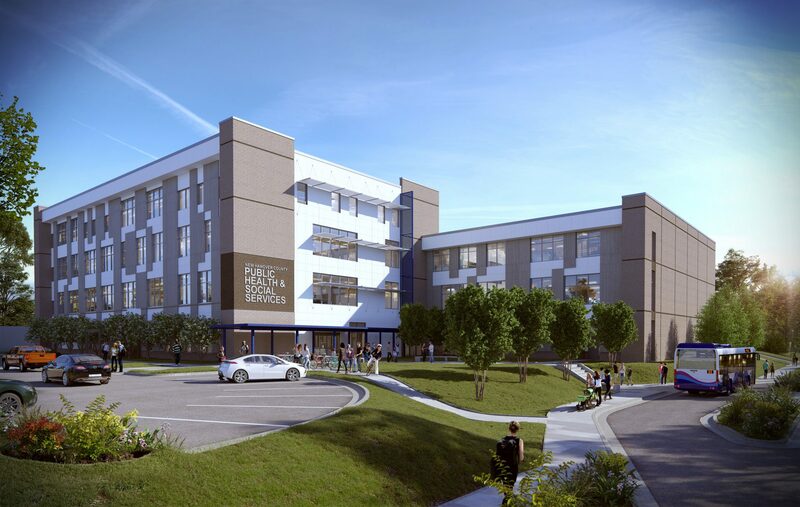 The new building will be 4-stories tall, with areas dedicated to servicing the public on the first three floors and department administration on the top floor. A 3,300 sf multipurpose room, equipped with a folding wall to divide the space, will accommodate the building’s occupants and is situated on the first floor. The top floor includes a fitness room and a large break room for staff, along with access to a terrace and green roof on top of the 3rd floor’s roof.